McLean County Administrator Bill Wasson (second from right) presents the county's proposed 2019 budget on Tuesday. 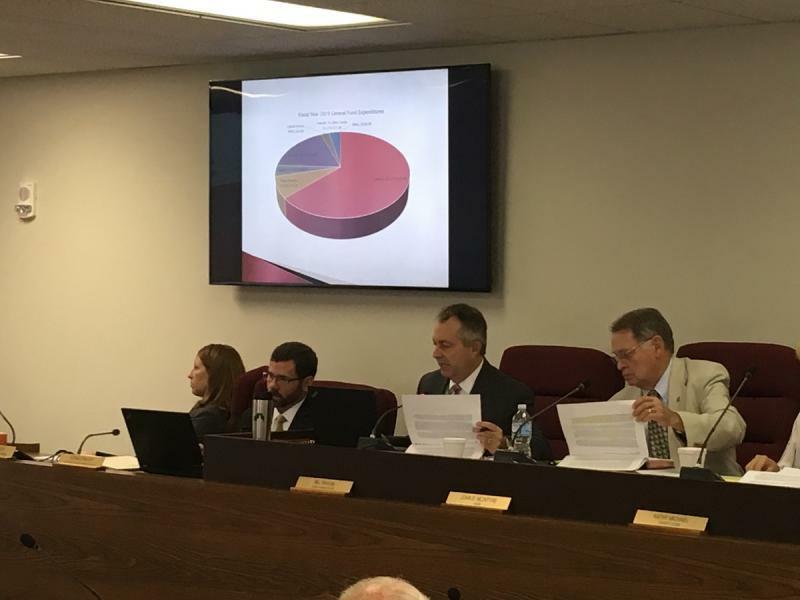 The $95.8 million proposed budget County Administrator Bill Wasson presented to the County Board on Tuesday marks a 1 percent increase over the current spending plan. The budget projects a 1 percent increase in equalized assessed valuation and intends to keep the county property tax rate the same as this year. The budget intends to add 16 full-time equivalent positions, including three for the new veterans court, 2.5 for the jail expansion, 1.75 for the county’s Behavioral Health Coordinating Council, and one new information technology security job. Non-union staff would see pay raises of 2.25 percent. The county is still in contract negotiations with McLean County sheriff’s deputies and corrections officers. “It’s always a problem when you are unable to keep salaries up for people,” County Board Chairman John McIntrye said of the current budget. “The cost of living goes up and everybody wants to get some kind of raise. Wasson indicated it helped to have a state budget in place for the first time in three years to help the county better plan its own budget. “This year we can say we at least had an adopted budget on time,” Wasson said. He added lower reimbursement rates from the state could put staffing for probation officers in jeopardy. 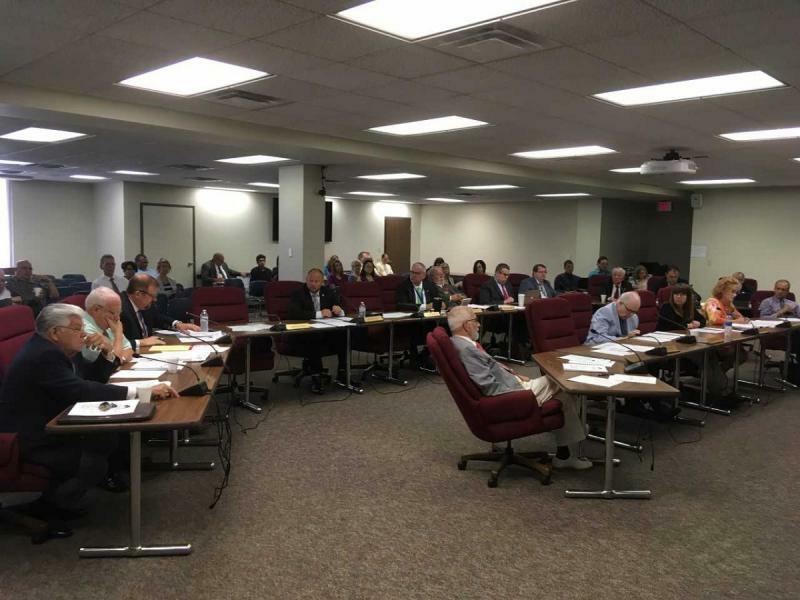 “Unless the Administrative Office of the Illinois Courts returns to a reimbursement level closer to that we have received in the last three years, there will be significant challenges relative to maintaining those staffing levels in the future,” Wasson told the County Board. The budget is scheduled for a vote in November. The County Board also approved two additional solar farm projects. It signed off on special use permits for Massachusetts-based Nexamp to construct a 2-megawatt facility in rural Heyworth. The board also approved a proposal for Toronto-based Amp Solar Development to put up a 4-megawatt, 29-acre solar farm on Hendrix Drive south of Bloomington. Amp had to resubmit the proposal to move the solar farm further away from several homes. County Board member Catherine Metsker, R-Carlock, who had opposed previous solar farm proposals on the basis they were stripping the county of farmland which could be used for crop production, approved this proposal based on a study which showed the land was considered of low value for agricultural land protection. UPDATED 11:10 a.m. | McLean County has paved the way for three new solar farms to be built.